A vessel refers to a tank or vessel that beer is stored in while it is fermenting. The vessels area contains all of the vessels in your brewery. Vessel Groups: This is the broadest and most simple differentiation. Vessel Types: Basically groups vessels that are of a specific type and share the same characteristics, normally by capacity and manufacturing specs eg stainless size and type, or cooper/forest/toast for barrels. You will find the the list of existing vessels by clicking on Vessels in the Make > In the Brewery area. You can search for particular vessels by using the search box located next to the ‘New’ button near the top of the screen or the advanced search button directly below that. Code, description and type are all required fields. Before you create your first vessel, you need to add a new vessel type that this vessel will belong to. You can do this in the Settings > Make > Vessel Types area. See some tips below. Default volume of tanks are set at this level. Volumes and design would be the obvious differences with tanks. Most data, unless strictly required to be numeric, is text. This means that if you have barrel numbers 1 to 200, in the system they will sort like a telephone book, i.e.. the sort order will be 1,11,111….. To avoid this and have more logical lists on reports etc consider renumbering 001,002…..010,011. It is just something to bear in mind. You can import vessels using excel, csv, xml or json formats. This can be useful for initially setting up Vinsight or also if you want to quickly create new vessels eg new barrels that you have purchased. Click here for detailed instructions on importing data (such as Vessels) into Vinsight. To view the vessel you will have a ‘View’ option next to each vessel line, this will display the vessel’s details including its code, description, type and current contents. You can view the composition of any particular vessel, broken down in a number of different ways. When viewing the Vessel, simply click on the relevant tab and you will see a table detailing the composition of the vessel grouped by that tab’s key. 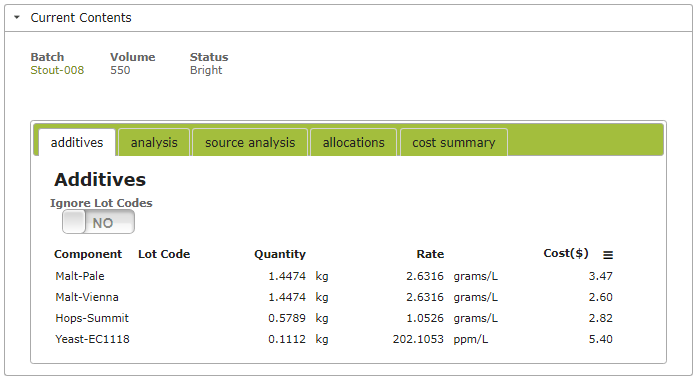 On the standard subscriptions or greater, you can also view a cost breakdown of the contents of any particular vessel by clicking on the ‘cost summary’ tab. To view the history of a particular vessel, view the vessel from the Vessels List, then click on the ‘Vessel History’ tab. This will bring up a list of the Bulk Operations that have been recorded on that vessel.